If a slots developer wants to design something that is right up our street then a good place to start is with the Victorian era; these were the generations of Brits who explored everywhere and discovered everything, extending the borders of the British Empire around the world. 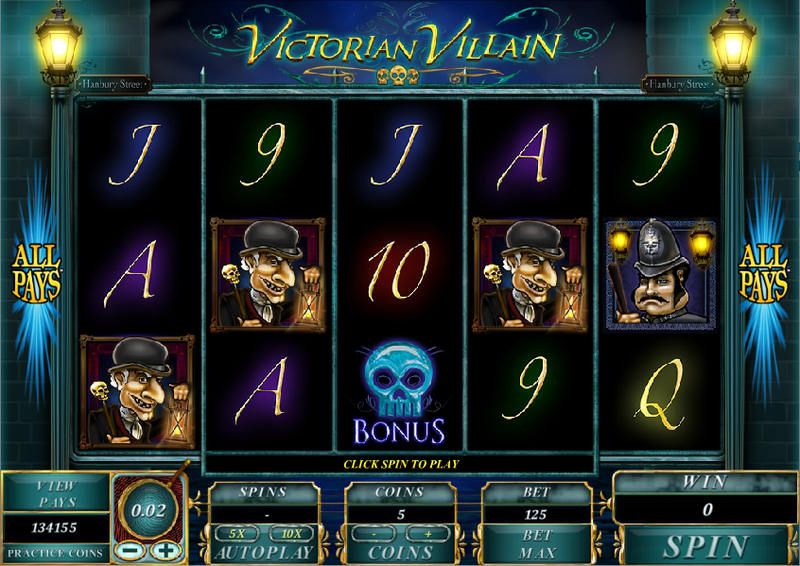 Back home the fledgling police service was investigating new methods of crime solving techniques and crime is what Microgaming’s Victorian Villain online slot is all about. Victorian Villain features five reels and an ‘All Pays’ payline structure which means as long as symbols are in adjacent reels you’re onto a winner. The reels are placed between two glowing street lights attached to which are signs labelled Hanbury Street. The main symbols are a policeman, a lady with a superb hat, the foxy female sleuth and the villain himself. 9, 10, J, Q and K make up the lower values and there are two bonus symbols – a skull and ‘Search for Clues’ which both trigger special features. The wild is the ‘Victorian Villain’ symbol which only appears on reels two, three or four. Now just click the button to begin the spins; more spins can be re-triggered within the feature and as you can see from the video below you can also trigger the Search for Clues round. Landing this symbol on reels three, four and five will transport you to a room filled with items which may or may not be clues. Your task is to pick symbols until you reveal a ‘Collect’ message; each item is worth a prize amount. Check it out in the video below. The main choice here is make the correct selection when awarded the free spins; we say go for the maximum number to try and trigger the Search For Clues bonus as well. This slot features a creepy soundtrack which adds to the overall dark atmosphere; it’s a simple looking game but an enjoyable one with a couple of bonus features and we recommend it.